It was 6th of April and I got up at about 9am in the morning with my legs still aching due to the long evening at Jantar Mantar on the previous day. The first thing I did after waking was to grab the newspaper as I still wasn't sure whether or not enough coverage will be given to Anna by the media. To my surprise Anna was on the first page. The snowball had started to roll and I knew that now it would not take long before the movement spreads to the general public, the middle class who generally like to sit home and observe things. I got up and after getting ready reached Jantar Mantar by 11:30am. On the way I distributed pamphlets in metro like the day before and people at least knew about the movement thanks to the media. I was still being discouraged but at least people knew what I was a part of. A positive change none-the-less. At Jantar Mantar I spent a few hours distributing pamphlets and explaining people who asked about the bill about the features of the bill. At the same time I could see many people carrying out different kind of antics trying to grab media attention. Well, some things would never change, would they? Anyways, I tried my best to keep out of the camera view as my parents were not aware that I was participating in this event. They are really skeptical about such things, specially because my dad also has a political background. When I got a bit tired I sat down with a group of people almost my age and was thus introduced to Manish, Ankit, Vikas and some others. They were students from different colleges, some of journalism, some of law, some of CA but one thing that bound them was they were at Jantar Mnatar for Anna. We talked about the current political scenario, how Anna would effect it and many other things. Also listened to Dr. Vishwas while he was anchoring on stage and also invited him to our group and got photographed with him. Around that time O.P. Chautala arrived. For the uninformed, Mr. Chautala is a politician from Haryana and leader of Indian National Lok Dal. Currently he is the leader of opposition in Haryana Assembly and has several cases including that of disproportionate assets pending against him and his family. When people saw Mr. Chautala in his trademark green pagdi going towards the stage with the aim of meeting Anna and using the stage for his political agenda everybody decided that he should not be allowed on stage. What followed was power of the masses. The politicians who have for years pushed around the public like cattle got a good taste of their own medicine. Chautala was not allowed on the stage by the public, slogans were raised against him and eventually he had to leave seething with anger due to the humiliation he had to suffer at the hands of the very people whom his security used to treat like garbage. After Chautala left Anna, having spent almost 30 hrs without food by that time addressed us and said, "We are Gandhian's and there is no place for such actions in our behavior. We should not behave so aggressively. Let them come but they will not be allowed on stage." All of started to prepare for the candle light march from India Gate to Jantar Mantar after this. Despite having been fasting for a day and a half most of the volunteers were on their tows. Everyone was running around doing some work or the other. No body needed to tell the volunteers to do the work, everyone would find a work for himself. It was like the 'Grand Indian Wedding' where everyone pitched in without being asked to. Around 4:45pm we started to assemble people for going to India Gate from Jantar Mantar. Around then Uma Bharti ji arrived. Uma Bharti was associated with BJP for a long time and she is also one of the prime faces of BJP during the Babri Masjid demolition. Despite Anna having asked us to exercise restraint the crowd surrounded Uma Bharti and raised slogans against her. She was not pushed around like Chautala ji was and even allowed to go in front of the stage for Anna's darshan but a crowd accompanied her raising slogans like 'Netagiri nahi chalegi', 'Sangh ke logon wapas jao', 'Saare neta chor hain' and after everything simply 'Chor Chor' when she started to leave. She wasn't allowed on stage like Chautala and with the media flocking her like a pack of hungry hyenas on a corpse with the public raising slogans against her she went towards the area where OB vans were parked. That was the only time in the five day fast by Anna when police had to intervene and stop the crowd from following her. Uma ji, the politician that she is, stood giving comments to media on the other side of the road while people riased slogans against her from across the police barricade. After this Anna again spoke and explained to us the Gandhian philosophy, why politicians should be allowed to visit, but not get on stage and why we, the youngsters should exercise restraint while opposing someone. 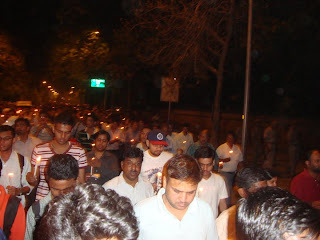 The youth soon left for Indian Gate in the form of a march and we distributed pamphlets in the way about Anna and the Jan lokpal. Gaurav Bakshi, one of Arvind Kejriwal's associate was the walking with us and to my surprise he was bare foot, when I asked the reason he replied, "I like it this way." The public raised slogans like 'Anna aap sangharsh karo hum aapke saath hain', 'Vande Matram' and 'Bharat Mata Ki Jai'. At India Gate about 2500-3000 people were assembled that evening. First of all there was an excellent nukkad-natak called Bhrashtachar (Corruption) by Asmita theater group and I think it was the first time in Indian history that there was a nukkad-natak at India Gate. At each dialog the public clapped and at each punch there were howls followed by silence so that the voice of only the theater artists is audible. It's not every day that you find an Indian audience doing that but that day was not a normal day by any measure. After this candles were distributed and lighted. I had never been part of a candle march before this. I was one of those who believed in shoot then talk rather than soothe and talk. This way of protest was new to me and a tough one too. With the wax falling on my hands, jeans and shoes it took me a while to become accustomed to walking with a candle in hand and I tell you, it is not as easy as it seems. The candle went out multiple number of times, add to that the fact that we were in a crowd and had to keep from walking very close to each other for the fear of someone's clothes catching fire. All that apart one thing struck me the most. The very people who while going to India Gate from Jantar Mantar were raising slogans on top of their voices were walking in silence with their heads bent down on the way back. Only the sound of them walking and vehicles engines stopped at crossings were audible, nothing else. It is not every day in India that you see 3000 people walking silently with candles in their hand and wax pouring on their hands. The crowd walked till the stage where Anna was and raised it's candles as a mark of solidarity. The next hour was spent in singing patriotic songs along with the singers and dancing to 'Ye desh hai veer jawanon ka'. One thing that amazed one and all was the presence of large number of youth in the march. In our country it's a general perception that the youth are uninterested in politics and are not as patriotic as they should be. Well, anyone who was there at Jantar Mantar that evening would have been forced to believe otherwise. Even Manish Sisodiya, one of the prime forces behind Arvind Kejriwal said, "The presence of youth here shows that the time for a change in the mindset has come." The very same evening I received another compliment for the youth by an elderly gentleman. After finishing with the patriotic songs I went for buying a bottle of water (was still fasting) from the MCD shop. An elderly man standing there said, "It's nice to see young people like you here." "Well, you people inspire us Uncle," I replied. "Don't get inspired by us. Make your own way. Had we been so good the country would not have got here," he said philosophically. I didn't reply but the sense of duty that I had been feeling since the previous day just got a bit heavier. In fact it is time to make our own path, it is time for Jan Lokpal. I returned home at 10:30pm that evening and distributed pamphlets in the metro. In fact today people were asking for the pamphlets and seeing me with awe as well as bit of respect. Hope the revolution continues. On my part I'm sure I'll be here the next morning too, for Anna and for Jan Lokpal. Well first I would like congratulate on 1 parts - a. your participation in the movement and b. your narration. Of corruption and a lone wager against it!